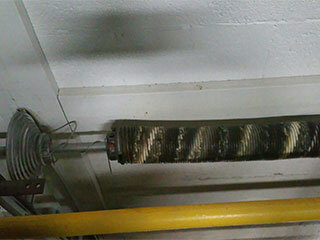 Garage door springs are sturdy, but regular use, rust and corrosion lead to irreparable damage and failure over time. It’s normal to feel frustrated when you discover that your springs have broken, especially when you can’t get in or out of your garage. However, in the hands of our skilled technicians, you can be sure that your problem will be solved professionally and in no time at all! Our company has been fixing garage doors for years. We’ve been called to thousands of repairs and have gained the expertise to diagnose issues with springs quickly and to repair them efficiently. Our company aims to make the costs of getting new springs as affordable as possible so you won't have to risk doing the repair work yourself to try to save money. Since we handle the entire process from start to finish, including sourcing all of the replacement parts directly from the manufacturers and negotiating lower prices, we're able to charge a lower cost overall. We're also transparent about the labor costs when we quote our price, so you know the precise amount you'll be billed once the work is done. Fitting the right size springs is essential to ensure that your door can be operated without trouble, no matter how heavy it is. It’s also critical to ensuring that the springs last and you won’t have to replace them prematurely. Whether we're repairing your torsion or extension springs, we make sure that they are correct by taking accurate measures of your door. Sometimes you’ll get no indication that your garage door springs are about to fail. You’ll often find that you can’t open your door at the most inconvenient time, like when you need to leave for that urgent meeting. If you’re in this situation, you can count on our fast-acting staff to send over a technician immediately. Garage Door Repair Rogers’s goal is to respond to emergencies within our service area within 15 minutes! We save even more time by bringing all of the equipment needed to repair or replace your springs. We work efficiently, removing your old springs and replacing them with new ones in less than an hour. We’re your one-stop specialists for quality garage door spring repairs. Contact us today!